I never wanted to be a “minister” particularly, though the word only means servant, and that’s what my life has been about, as I’ve worked to create peace, social justice, community radio stations, educate on domestic violence, environmental sustainability, etc. I pursued a ministry certificate purely because it was recommended when I became a Transpersonal Hypnotherapist in 2006, to provide legal protection while practicing the skill in a slow-moving state that hasn’t developed protocols for certifying practitioners yet. I am also a recovering mind control subject (probably MKULTRA), a multiple-personality-in-healing, an award-winning journalist and author, business consultant, public speaker, Permaculture designer, and artist. As I’ve healed aspects of my multiple personality in the last two decades, I’ve lost much of my super-productivity, but gained peace, relieved health issues, fulfilled artistic inclinations, developed a sense of humor, increased social skills, and attracted more friends than ever in my life. I still have events in which I struggle for hope to stay alive, and want to encourage others that, despite difficult spells, there is hope. At age 19, in 1971, I had an experience in which I felt I “knew Jesus in my bones” and have continued to feel his presence throughout my life, sometimes in miraculous ways, even after decades of calling myself an atheist, pagan, pantheist, animist, shamanic practitioner, etc. At age 42, in 1994, having moved to a desert hermitage, I began to see the Mystery in a way that led me into shamanic practice, connecting with multi-dimensional Helpers, traveling in other dimensions, past-life reconnections, communications with the deceased, healings, and more. In February 2014, I was newly moved by Martin Luther King‘s ministry, fulfilling both his religious and activist calling. I saw a parallel between the Civil Rights movement and the yet-unimagined fight for the rights of MK subjects, and felt I was finally close to taking up activism again, to recognize mind control subjects and their needs. I Soon after, I learned about Black Elk‘s early spiritual experiences, how he kept them a secret from everyone, and so “demons” wouldn’t leave him alone, and he became isolated, and his tribe thought him “angry and strange.” Eventually, he told his experiences to the elders, and they recognized his situation: the demons would continue to hound him until he accepted his calling. Dark forces seem to have been dogging my life since childhood, but they seemed to be getting more aggressive in the last few years, sabotaging even beloved endeavors like teaching Permaculture. With Black Elk’s story, I knew that I’d known for awhile that I was called to do something more difficult than the activities I was planning, because I simply didn’t want to do this other thing. I’d tried and failed a few times, so I’d given up, afraid of the challenge. The work I’d felt called to do was to speak out about the plight of MK subjects – slaves if any are – and our human rights and religious freedom rights to heal ourselves. And the right to speak about experiences in other dimensions without being called delusional and being medicated or locked up. When the shamanic experiences began, like it or not, they included UFOs and aliens – just like mystics have described throughout time. 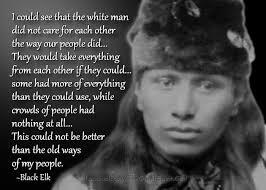 After reading about Black Elk, I renewed my vows to serve our human and Earth community, regardless of whether I wanted to step forward with ridiculed themes of mind control and a highly- and weirdly-populated cosmos. I’ve been slow (extremely cautious) in determining the best direction for my work, but the energies are stirring…. I pray this site is a place to protect and expand our healing options, while providing specific help for healing along our often lonely paths. More about my life of writing, activism, consulting, art, and more can be found at jeaneisenhower.com. My Spiritual History is here.